Home / essential scales / 5 Common Mistakes Beginner and Intermediate Lead Guitar Players Always Make! 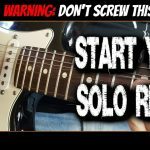 Learn how to avoid and how to fix some of the most common mistakes beginner and intermediate guitar players make when it comes to learning to solo. Overcome these and you really can supercharge your progress, improve faster on guitar and stop getting held up. This can cause you to press down on the strings too hard making notes sound out of tune. Poor finger accuracy can also lead to lifting up the fingers after playing a note., slowing you down and making it hard to play smoothly. Don’t use too much pick when you play. It’s way harder to get good controlled picking. Just use the very tip of the pick. And make sure your picking hand stays close to the strings when you play. If your picking hand is too far away you may never develop awesome picking! 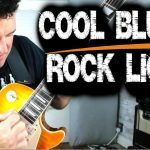 Common Guitar Mistake 3 – Weak Pull Offs! To get strong sounding pull offs ‘flick’ your finger off the side of the string. If you pull the string out of tune as you pull off it’s probably due to poor finger independence. Follow the simple trick in the lesson to fix this. Common Guitar Mistake 4 – Bending Mistakes! Here you’ll learn how to control and ‘cut off’ bends before you let it down. To do this we use left and right hand muting techniques. Practice these techniques: they will tidy up your bending. String noise can be a big problem on guitar. Muting or ‘string damping’ technique is how to fix this. The picking hand wants to rest lightly on any unplayed strings to keep them quiet and the fretting fingers need to lie slightly flat across the strings. The fingertips can also help by muting neighboring strings. This also helps control unwanted string noise. Good luck fixing up these common guitar problems, you’ll definitely find they make a massive difference to how your playing sounds. Good luck!